I wrote this song incomplete several years ago, like many, though the concept and images were clear, and some of the main lines and verses. In the Fall of 2007 to Spring of 2008 I was trying to hammer out more originals for the upcoming CD project, and I chose this one both because it was nearly complete and because I could, it reflected feelings I was feeling, so I could try and finish writing it. Songs come from inspiration, and some come out complete and perfect start to finish. But more often they are incomplete, I can’t find the right words in some places, or the words I use in spots aren’t quite right, or sometimes I just have one verse and a chorus, or even just a line, and a vision, a series of images that tell the story I want to tell, express the feelings, but I still haven’t found the words. Then they take a serious effort to hammer them into shape, finding the right words to fill the missing places where I couldn’t find the right words, choose which verses to keep, or add ones that are missing, choose the order.. each song is different in what it takes to finish it. I finished it in the spring of 2008, and recorded a version just before I left for Alaska. I performed it for the first time that summer at the Alaska fairs. Then I started playing it regularly as I started performing during the winter season in Florida. So at the time this was recorded , it is still a new song, and still evolving. 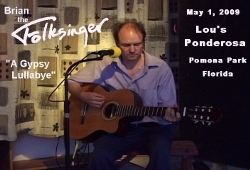 Like when I performed this at Lou’s Ponderosa for a video shoot, I performed it on guitar, two different versions, on with more finger-style playing,as it was written, and this one, where I pretty well just strummed the guitar. Also because it was new, I messed up one of the verses in this video. I also perhaps was thinking of spece for other instruments and left a blank verse in the middle for a solo break. back in the studio, I was able to fix the messed up word by dubbing in a piece from the previous performance, though you can see me messing up in the video. To both smooth over that editing, and to fill the solo breaks, and just to see how it sounded, I added a flute part in the studio. I’ll open up a post with both versions as just adio tracks for comparison and invite comments, flute or no flute, finger-style or strummed for the next CD. In the end, though, I think the new paradigm for music is no longer having one standard version of a song. Instead, I’ll release multiple versions of the song, just like I play it, and let people choose for themselves which they like to listen to, or all. This entry was posted on Friday, May 1st, 2009 at 6:25 pm	and is filed under Music. You can follow any responses to this entry through the RSS 2.0 feed. Both comments and pings are currently closed.